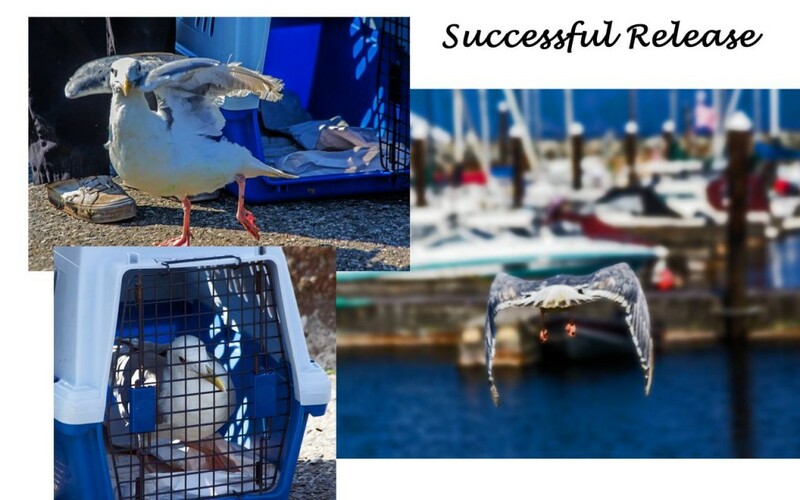 On August 8th, this gull was found entangled in fishing line. The line was around the gull and a rock, completely trapping the gull. Thanks to a nearby boater who cut the gull free from the rock and passer-by Siew Sim who removed most of the fishing line, the gull was then brought to us for care. 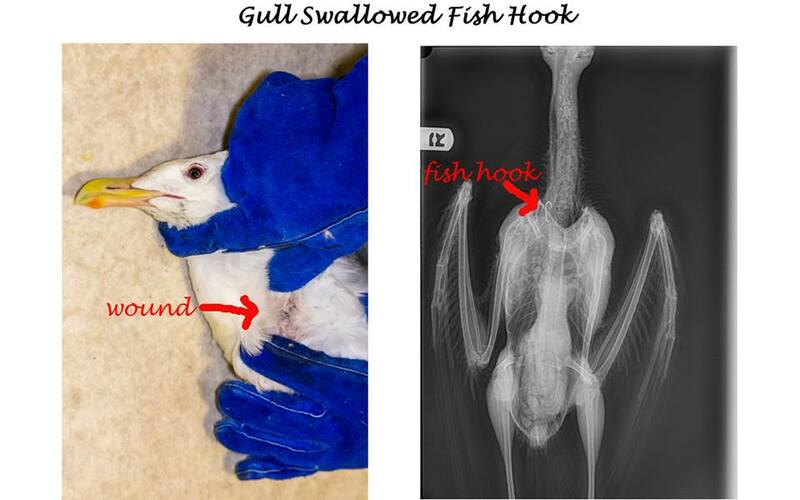 Unfortunately the gull had swallowed the fishing hook, so we had him X-rayed at Sechelt Animal Hospital to determine where the hook was. The x-ray showed it was embedded far down in the bird’s oesophagus. Our sincere thanks goes to Dr. Heather James and veterinary student Felix Mischko who, along with Clint, tirelessly worked for a number of hours trying to remove the hook, first using an endoscope and flexible clamp and ultimately operating on the gull. The hook was successfully removed and the gull recovered well after being under care on antibiotics and pain-killers. He was released on August 18th and flew off strongly, circled once, then joined other gulls some distance away. One more successful release, one more life saved! Please do not discard unwanted fishing line or tackle, this is not the first bird we have had brought to us entangled in it. When we had a Kingfisher in care, the only food he would eat was very small fish. One day we had some small fish left over and decided to give them to the gulls in our large outside aviary. 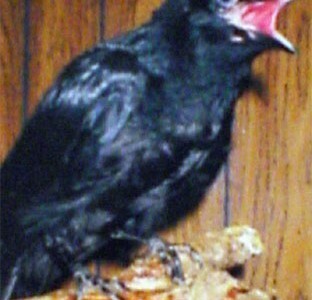 In the aviary we had a number of crows, including a tame crow, ‘Frankie” who at that time was still quite young. We enjoyed watching Frankie’s antics as he learned how to ”hide” his food. He would grab a piece of food, make a hole in the ground, place the food into it, and then cover the hole with leaves. On occasions he would try hiding the food in other holes he found throughout the aviary. Frankie likes to sit on the shoulders of the volunteers who clean the aviary and on the day in question, our volunteer, Barbara Lee, was working in the aviary, when Frankie flew on to her shoulder. She then felt something being pushed into her ear by Frankie so immediately retrieved the object. Yes, it was one of the tiny fish! Frankie had noticed Barbara Lee’s ear and decided it was a good hiding place for his food. For some reason Barbara Lee didn’t agree! 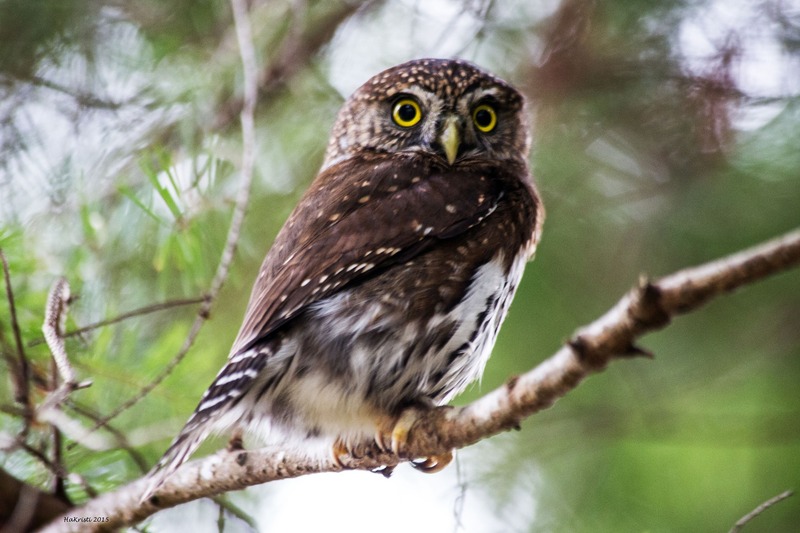 On occasion a member of the public will mis-identify a wild bird, but we were surprised to find a renowned ornithologist also made this mistake! 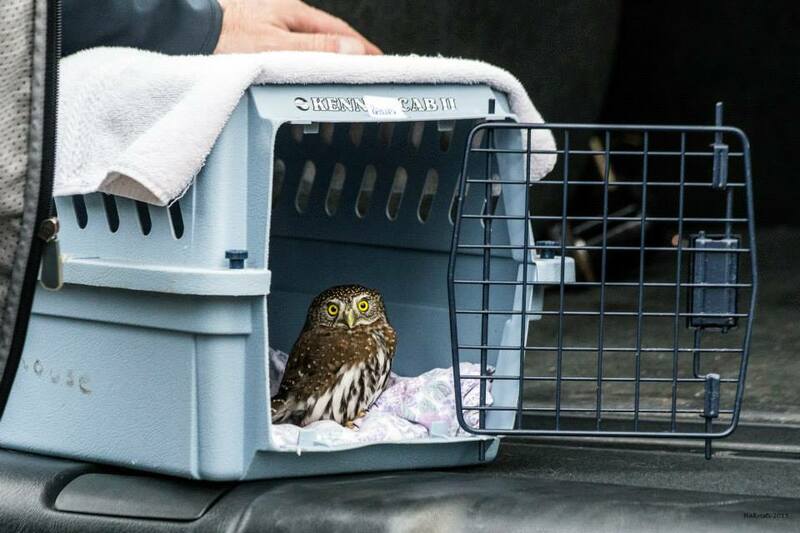 During a nesting survey on the Sunshine Coast, he found a young bird being harassed by a hawk. The ornithologist arranged for the bird, which he identified as a young blue grouse, to be brought to us for care. We had never raised a young grouse before and, after a few weeks, were surprised to see the hint of red appear around his neck area. The young bird continued to grow…. and grow ….. and grow! He changed colours from greyish to speckled brown (was he a ruffed grouse?) to black. What was he? 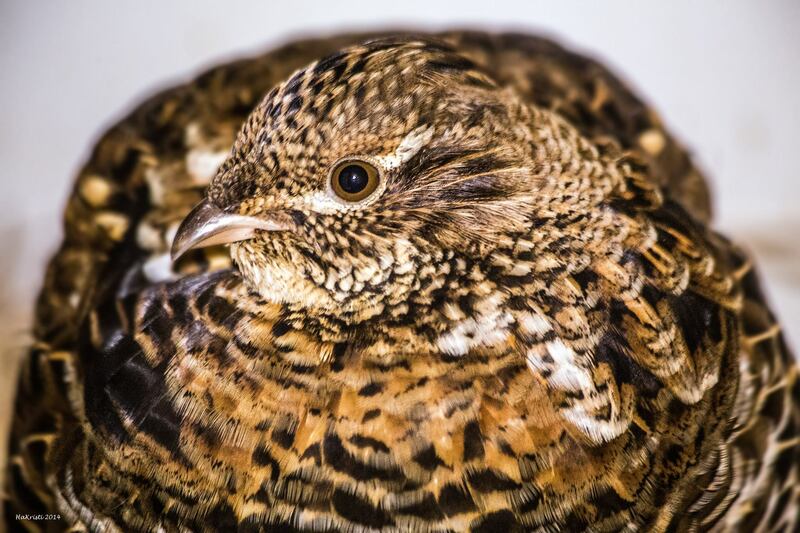 Soon it became apparent, our young blue grouse was in fact a male TURKEY! Now weighing in at 40 lbs. 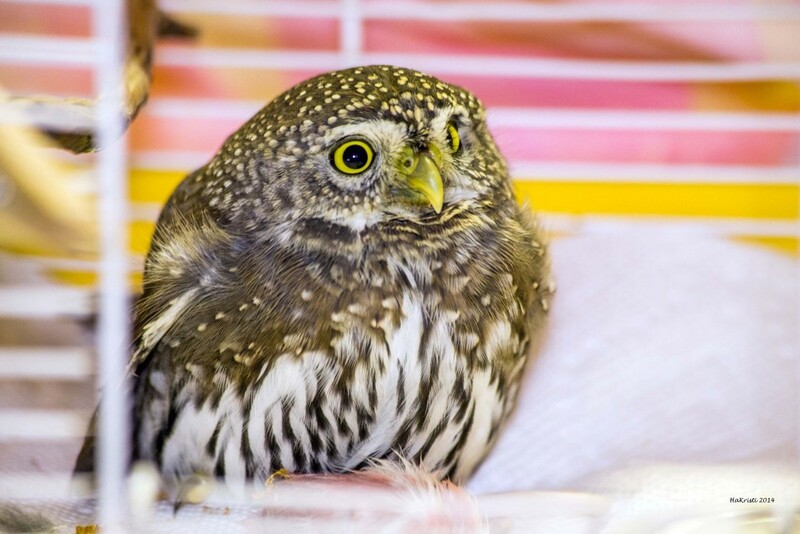 “Ricky” has become the mascot of the Centre. He follows everyone around in our large aviary and loves a hug! 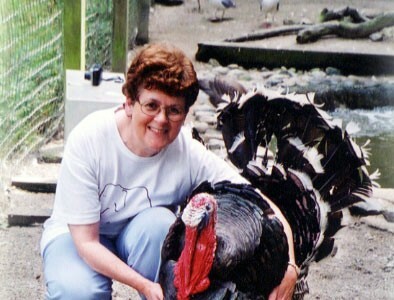 He has even persuaded some people to stop eating turkey – a 40lb turkey can be pretty persuasive!